In an uncertain climate of heightened geopolitical tensions and economic anxieties, gold remains a safe haven for many an investor. Sure, gold isn’t an up-and-coming, ‘thrilling’ commodity on the razor edge of technological revolution. And it has nothing to do with electric cars, Elon Musk, or sustainable innovation. So, no gold isn’t going to win any awards for hipness any time soon, but that’s actually a big part of its appeal. Rather, gold is stable, reliable, classical. It’s the Mozart of the metal world, if you will. And it’s not ‘trending’ so much as it is timeless. One company extremely well-versed in this enduring appeal is today’s ASX micro-cap explorer, whose focus is all about aggressively growing its resource base in gold-emblazoned Western Australia. This Perth-based junior is searching for this most reliable of metals in one of Australia’s most prominent lithium and gold mining districts: Western Australia’s globally renowned Goldfields region. The apple of this company’s eye is its flagship Forrestania Project, an advanced asset that’s already been JORC-ed. There’s an existing Mineral Resource here of 5.9 Mt at 1.25 grams per tonne for 240,000 ounces of gold, which the company is looking to double by the end of the year. However it is an early stage of this company’s development and if considering this stock for your portfolio you should take all public information into account and seek professional financial advice. This project is situated in the heart of the resource-rich Southern Cross Belt, which hosts a known gold endowment of more than 10 million ounces. The company has its hands on two major deposits – Lady Ada and Lady Magdalene – which it owns via joint venture partnership. In addition to these two deposits, which have been subject to drilling campaigns and a compelling scoping study this year, the company also holds additional JORC resources in the region and plenty of exploration targets. Exploration undertaken so far suggests that what this company has on its hands is an expansive gold system spanning some 2 kilometres, with new major high-grade zones being discovered as drilling progresses, underway as we speak. Since acquiring Forrestania in March, the company has made fast, purposeful work of this project. In only six months, it’s already grown its resource some 60% through significant investment in exploration, upgrading the resource from Inferred to Indicated. The Phase 2 drilling program currently afoot is targeting high-grade extensions along strike and down dip at both the Lady Ada and Lady Magdalene deposits, with potential for mineralisation to continue along strike from the current resource. Intriguingly, this is very much underexplored territory. Both deposits were previously subject to shallow, surface drilling only, which managed to miss the newly defined, SSE-plunging, high-grade zones at both deposits. Assay results are due back any day, with a Mineral Resource Estimate (MRE) expected to be updated for Lady Ada and Lady Magdalene by the end of the year. These results are expected, in fact, to double the MRE. In short, a chock-full dance card for one tiny but sure-footed ASX explorer. 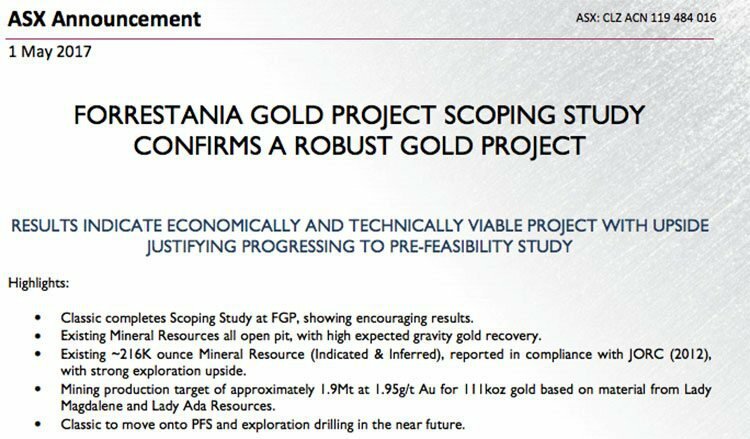 What’s more, a recent scoping study has reinforced both the technical and financial viability of the project, suggesting that the company has a robust gold play on its hands. The study envisages open pit mining from both deposits, which will make for low operational risk. It also displays excellent margins at current gold prices, providing significant cashflow, on top of low capital expenditure. That isn’t all this steadfast gold junior is holding, either. While Forrestania is its chief focus, a key part of this company’s strategy is the rigorous development of a sturdy base. And this shows in its deep portfolio, with additional tenements spanning 178 square kilometres in the prestigious Murchison, Fraser Range and Eastern Goldfields provinces, and in areas identified with high-grade nickel, copper, cobalt, manganese, gold and base metal targets. This ASX junior is currently capped at a miniscule $3.4 million, so it’s really only just starting out. Yet with the remaining months of 2017 packed out with purposeful activity, this gold explorer has a lot of its work cut out for it, and it’s plunging forward in steady strides. There’s a lot going on here, so let’s get straight to the crux of the matter. At the heart of Classic Minerals’ (ASX:CLZ) business is a clear strategy whose rather elegant simplicity matches its name. Focused on building a rock-solid base, CLZ is working quickly to increase its resource base through aggressive exploration and strategic acquisition. The company is targeting a JORC resource of 500,000 oz gold before the end of the year. This will help underpin its plans to establish an on-site processing plant as envisaged in the Scoping Study released to the market in May this year. This Perth-based exploration company has a long game in mind. It’s taken sharp notice of the potential for its significant ongoing exploration success and resource growth, and reckons that this could see its flagship Forrestania project transformed from a humble gold camp into a major WA hotspot. To make this process a lot smoother, CLZ is captained by a team of experienced executives with considerable experience in the Australian gold space, especially in the Goldfields region, and an expansive track-record of exploration success, mine development and gold production. A particularly noteworthy player at CLZ’s helm is managing director and CEO, Justin Doutch, whose industry experience spans 15 years, with particular emphasis on engineering and exploration roles. Doutch was instrumental in leading discovery of the Mammoth nickel-copper deposit in the nearby Fraser Range. He’s a valuable local heavyweight to have on your side when you’re homing in on Western Australian gold. Speaking of which, let’s look now at the pivotal site for CLZ’s operations: its Forrestania Gold Project. The takeaway? Here is a high-quality and considerably advanced asset that already has a JORC Resource, replete with hefty exploration upside. The Forrestania Project is situated some 450 kilometres south-east of Perth, 235 kilometres west of Kalgoorlie, and 100 kilometres south of the town of Southern Cross — directly in the heart the prestigious Southern Cross Greenstone Belt, which is home to recognised gold endowment of more than ten million ounces. 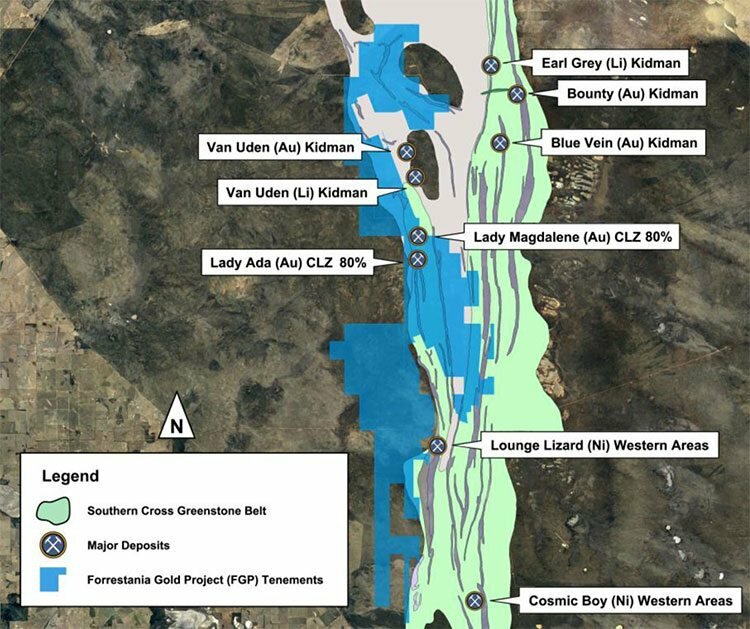 Interestingly, although the Southern Cross Greenstone Belt has a known substantial gold endowment, the space CLZ has mapped out here has seen minimal exploration over the past 25 years, owing to the particular focuses of previous owners. Forrestania comprises a range of granted exploration and prospecting licences spanning 450 square kilometres. CLZ owns 80% of the Lady Ada and Lady Magdalene deposits, which it has acquired via its JV partner, Hannans Ltd (ASX:HNR). In addition to the Lady Ada and Lady Magdalene deposits, Classic also owns 100% of the bif-hosted Lady Lila deposit (1km east of Lady Ada and similar geology to Bounty/Blue Vein) and the high grade Kat Gap deposit (JORC 2004 resource of 56,000 oz Au). The project location itself is ideal, with access via historic haul roads which branch off the well-maintained unsealed Forrestania-Southern Cross Road. This location offers multiple logistical advantages, including short commute for employees, close proximity to transport infrastructure, favourable climate, and grid power and water — all of which bodes nicely for CLZ, should it manage to rack up a commercial supply. Of course, as with all minerals exploration, success is no guarantee – consider your own personal circumstances before investing, and seek professional financial advice. Let’s take a more detailed look now at the rigorous drilling regime that CLZ has delved into over this year. Drilling has recently identified a new major high-grade zone at the Lady Magdalene deposit, which has served to reinforce CLZ’s underlying strategy of systematically increasing its existing Mineral Resource Estimate. Phase 2 reverse circulation (RC) drilling is now complete at the Gap Zone — a priority target situated between the Lady Magdalene and Lady Ada deposits, comprising a continuous 1.7 kilometre ore body. 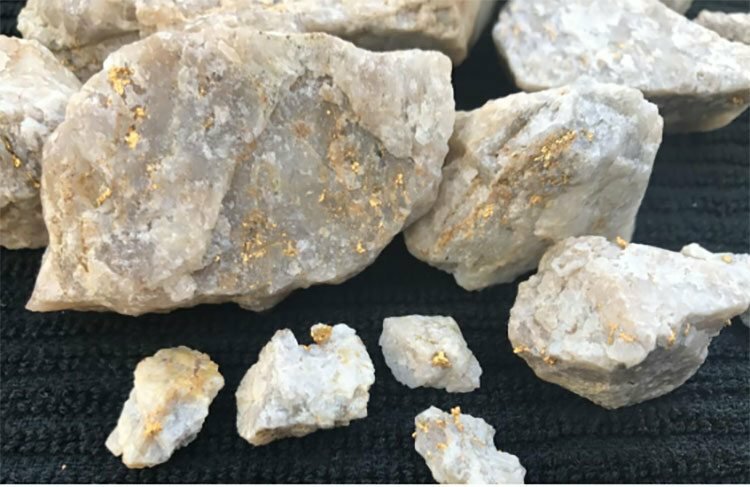 On-ground geological work has also included mapping and prospecting, particularly around Lady Ada, which has yielded high-grade gold samples (in the form of visible gold in quartz samples). After extensive geological review and interpretation (including use of data generated from the Phase 1 drill campaign), CLZ has noted that there is significant potential here to uncover a repetition of the Lady Ada/Lady Magdalene ore bodies between the existing deposits. CLZ has identified analogous characteristics between Lady Ada and Lady Magdalene. The ore body starts off with a flat structure and then deepens on a south-eastern trend whilst increasing in grade. Previously, this area between the Lady Ada and Lady Magdalene ore bodies has only been subjected to very shallow drilling, with some near-surface hits indicative of the flat lying feature shared by both. 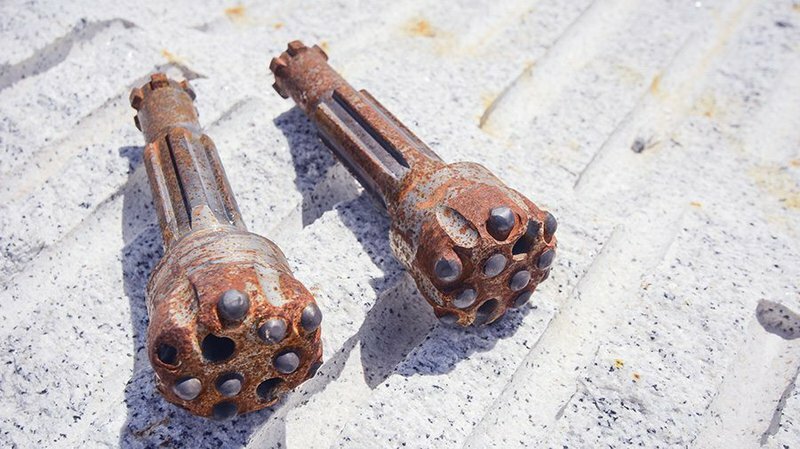 CLZ has planned a number of drill holes to further investigate this potential. 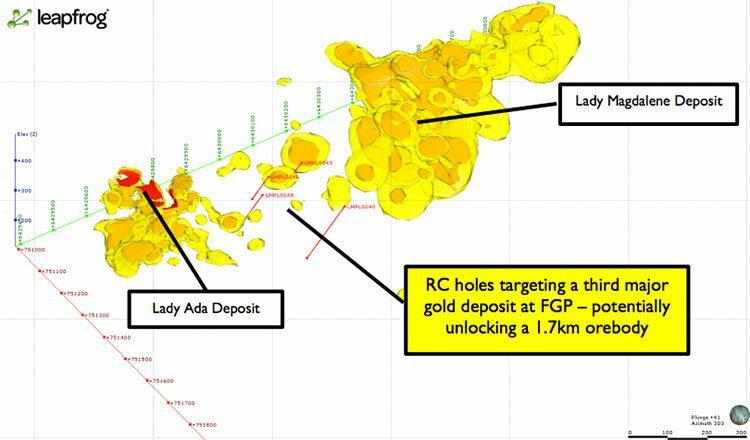 Importantly, the identification of an additional ore body linking both deposits would result in a significant increase to the existing Mineral Resource base, unlocking a massive gold system spanning around 1.7 kilometres, or longer if mineralisation continues to extend to the south of Lady Ada. Additional assays also identify the presence of narrow, high grade structures at Lady Magdalene (2 metres at 12.46 grams per tonne from 87 metres, 2 metres at 8.59 grams per tonne from 48 metres) within a broad zone of shallow dipping mineralisation close to the surface. With both deposits, high-grade zones remain open at depth and along strike, meriting additional follow-up activity in the near future. The current drilling program underway is focused on the Lady Magdalene deposit, with a further 10,000 metres planned to be undertaken Q2 2018. 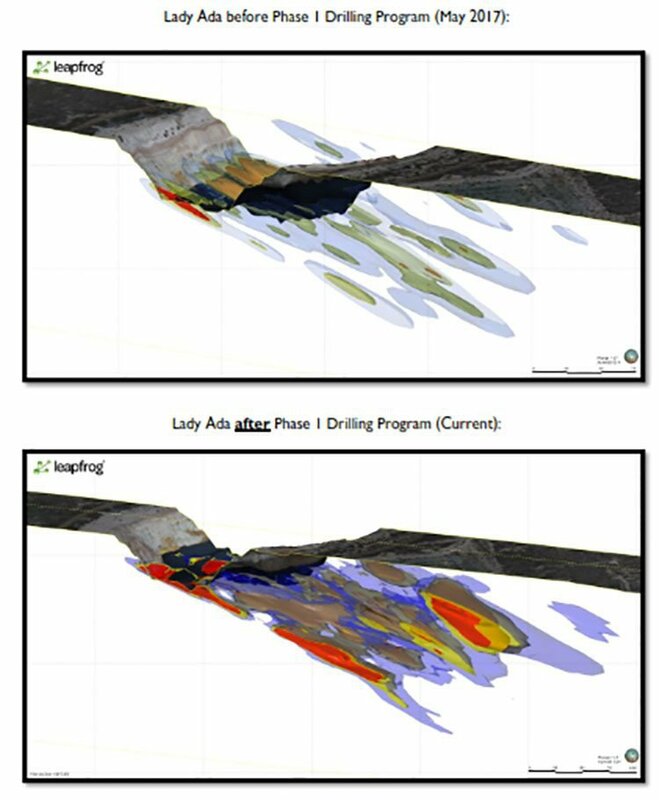 This current program has been designed to further test high-grade extensions of both the Lady Magdalene and Lady Ada deposits identified during Phase 1 drilling. Phase 2 aims to bolster confidence in the existing Mineral Resource at the Lady Magdalene and Lady Ada deposits respectively, and has considerable potential to add significant ounces to CLZ’s existing Resource base. There are 13,000m of assay results due in the coming days/weeks. Now is the time to get on board before those results start feeding out to the market. CLZ’s plan is to unlock the future of this project with an on-site processing facility, which will monetise the numerous greenfield and brownfield exploration targets and known deposits within trucking range of the proposed plant, in turn providing low capital expenditure mine life extension opportunities. Encouragingly, results indicate that the project is economically and technically viable. The existing Mineral Resources are all open pit, with high expected gravity gold recovery. Open pit mining, moreover, also allows for low operational risk. Confirming a 216,000 ounce Mineral Resource (Indicated and Inferred) with strong exploration upside, the scoping study indicates that Forrestania has a mining production target of approximately 1.9 million tonnes at 1.95 grams per tonne of gold for 111,000 ounces of gold. This will be produced over an initial two and a half year mine life at a sustaining cost of A$1,080 – $1,160 per ounce, a very competitive cost position. Based on a $1,700 per ounce gold price, the project will generate a pre-tax cashflow of A$60 –$70 million. Promisingly, the study suggests low capital expenditure of A$25-$35 million, with payback/cashflow expected in 14 months. What’s more, the project is expected to have a relatively short construction and mine rehabilitation timeframe. We’re looking at around 9-12 months from start of plant construction to commissioning. These results bode very positively for CLZ, showing extremely attractive margins at current gold prices, and providing significantly forecasted cashflow. Importantly, this provides strong encouragement for CLZ to power into its next stages of exploration and development, with the upside indicated justifying progression to a pre-feasibility study (PFS) in the coming months. The PFS will incorporate the revised JORC resource, new pit optimisations and, due to the likelihood of the resource increasing to 500,000 oz Au or higher, will likely result in the LOM being greatly extended with gold production increasing. The increased production will bring down the all-in sustaining costs of production and will result in a far higher NPV. Gold prices have surged 15% this year, rising every month apart from June, as investors consider the implications of rising conflict in Asia. As that first article explains, mounting tensions between North Korea and the US have spurred demand for assets that are thought to be more likely to hold their value in the case of a global crisis — specifically, gold. This increased demand has pushed the gold price to trade as high as US$1,342.55 an ounce, the highest level for a year, according to Bloomberg data in early September. It therefore seems that CLZ is looking for a highly covetable commodity at the right time, and in the right place. At the same time, we should point out that commodity prices can also fluctuate down, so caution should be applied to any investment decision and not be based on historical spot prices alone. CLZ’s mission is to rapidly monetise its Forrestania Gold Project through innovative approaches to exploration, development, mining, processing and commercial structures. As we’ve mentioned, at the heart of all of this is an underlying strategy to systematically and aggressively build up its Resource base, emerging as a formidable gold player in a globally renowned region. This is still an early-stage play, and CLZ is valued at a tiny $3.4 million. Yet if what this ASX gold junior has demonstrated it can do in a mere six-month period is any indication of its potential and drive, there’s lots of scope here for future growth. Not to mention the fact that the region CLZ is traversing is heavily underexplored, with considerable exploration upside. With an emphasis on building its resources inventory and firming up its JORC classification, CLZ has a lot of bustling activity planned over the coming months and into 2018. Upcoming activities include (but aren’t by any means limited to) exploration target generation and testing, further research and data review, and mapping and surveying. CLZ plans to increase its Mineral Resource Estimate for Lady Ada, followed by an updated Lady Magdalene Mineral Resource Estimate before the end of the year. And on top of that, assays are expected back in the coming days for Phase 2 drilling (13,000m). All of this points towards things getting even busier for this gold junior in the not-so-distant future, translating to what we expect will be a torrent of news flow. And here at the Next Small Cap , we’ll be sure to keep you in the know.